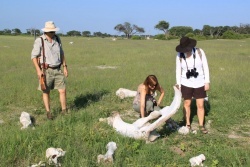 An exciting way to see Africa’s spectacular scenery and wildlife. You travel in comfort in open sided 4x4 Landrovers or Landcruisers with tiered seats for up to eight explorers. Typically you go out early in the morning and return for a late breakfast, or late afternoon, returning after sunset. In some areas you can go out on night drives using a special searchlight to spot the less often seen nocturnal species. A slower, more intimate way of going out to view wildlife. Your feet are in contact with the earth and you are fully in nature. You can see the Little Five, easily stopping for an ant lion or a leopard tortoise. 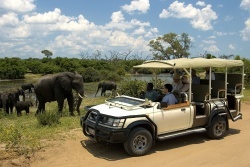 And you could get up close and personal with one of the Big Five - a buffalo or an elephant! Your armed Professional Guide will provide instructions for your safety, whilst interpeting what you see. Imagine being on a horse, far, far off road, where no vehicle could possibly go, cantering along with antelope, splashing through the channels, spotting a lion in the grass, or elephants in the forest. 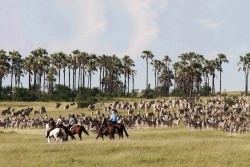 Riding safaris are usually for experienced riders and last for several days, fly camping in the bush, or riding out from and returning to the lodge each day. The Kalahari and the Okovango Delta offer superb riding opportunities. Short rides are available in Victoria Falls. Drift down a mighty African river, viewing game and birds on the banks - amongst riverine trees, on open flood plains, in steep gorges and past palm filled islands. You paddle yourself in two-man Canadian canoes - or have an experienced paddler. A comfortable, peaceful way to be in the wild. 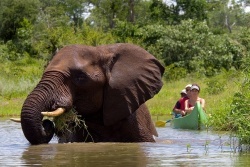 Specialised, highly experienced River Guides ensure your safari is interesting and safe. You are on the water mornings and late afternoon, stopping for a leisurely picnic lunch on a deserted river bank or island. You overnight in lodges or temporary camps set up for you. Trips can be two hours to several days. A Mokoro is a traditional, two-person dug-out canoe. These are used mainly in the Okavango Delta and Linyati, but also in Zambia. Your Guide will pole you silently along on still, crystal clear waters, through passages of papyrus, into open lagoons covered in water lilies, always revealing a wonderful new vista. On the flood plains of Zambia you travel along narrow channels threading through the grassland - it feels as if you are floating along in a sea of golden grass. On larger rivers, such as the Chobe, Kafue and Zambezi, you can take a boat cruise, spotting waterbirds, animals on the banks, and watching the sunset, returning just after dark. Dinner cruises are also on offer. 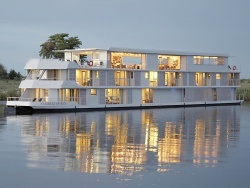 On Lake Kariba and the Chobe River we can arrange for you to sleep ad safari on a luxurious houseboat. During the day you cruise along, enjoying the breeze, watching game and waterfowl on the river banks. At sunset the boat is moored, you sip your sundowners as the fiery sun sets over the water. You fall asleep afer a delicious dinner, listening to the gentle lapping of the water and the mysterious sounds of the African night. 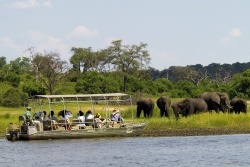 Small tender boats are towed along for you to go fishing, or game viewing close up and, on the Chobe, you are taken on game drives into the interior of the Park. The warm, tropical waters around Mozambique offer some of the finest coral reefs protected by extensive Marine Parks. The stunningly beautiful Quirimbas Archipeligo, and Bazaruto and Benguerra Islands, offer superb accommodation, first class dive operations and wonderful dive sites. Divers have a good chance of seeing whale sharks, turtles, rays, bat fish, Napolean wrasse and nudibranches. There is even a chance of encountering a rare dugong. Be aware: All safari activites are season or weather dependent. Our local knowledge and expertise will avoid you being in the right place, but at the wrong time.